People in Mid-Michigan have been finding letters addressed to them from a man they don't know, and many are weirded out by it. "I've never received anything weird like this before," Jodie Westfall said. 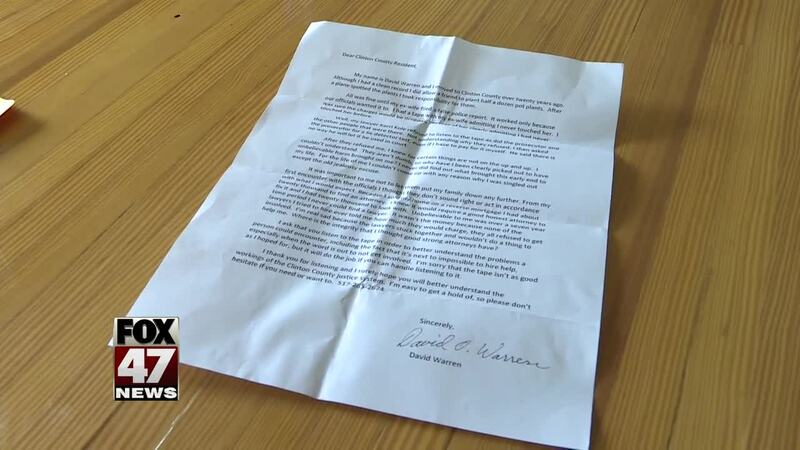 Westfall's husband found the letter in their mailbox on Monday. She thought it was odd that it didn't have a return address but opened it anyway. Inside, she found a CD and a note that details how the justice system is corrupt and how the sender, David Warren thought he was wrongly accused. "My concern is where did he get my address? My name. And all these other people's address, and why? I mean it has nothing to pertain to me," Westfall said. Westfall has no idea why she received the letter in the first place, but the fact that he has her address is downright creepy. "Am I going to have to watch when I'm pulling in the driveway, is someone following me?" she said. I was able to track down David Warren. He told me he sent the letters and CD to make people "aware" of what's going on in their community. Warren says sending and preparing the packages cost him a lot of money, but he isn't going to stop. "I'm going to keep doing it. I don't care if I have to hock what I have, until I find out someone I know has read them. That's all my parents would say I'm responsible for, is to make people aware of it," Warren said. That didn't make Westfall feel any more comfortable about the situation. "I guess he is having a hard time trying to find someone to help him and I understand that, but in another creepy way, but he's also invading our privacy," she said. Warren said he paid a woman for a list of the addresses and that it was completely random. Warren says he started the process about a year ago. St. John's police told me that Warren didn't break any laws and isn't dangerous. If you get a letter, give it to police or throw it away.